When Timur died in 1405 AD, he left his empire to his sons, and they left it to their sons. But that last Mongol empire got gradually weaker and weaker. By 1506, Iran, Afghanistan, and Pakistan broke up into many small kingdoms. Some people known as the Safavids began to form a religious Sufi movement, Their goal was to force the Mongol invaders out of Iran and build a new, Iranian Shiite Islamic government. In 1500, when the Safavid general Heydar was killed, his 13 year old son, Ismail led a campaign to avenge his father and take power in Iran. By 1502, when Ismail was 15 years old, he had defeated his enemies. He was crowned Shah (king) of Iran. Many of his followers (known as Twelvers) also considered Ismail to be a Shiite saint. The Twelvers probably got some of their ideas from the earlier Mazdakite movement. Ismail and the Safavids were part of the Altaic movement into West Asia. They spoke a Turkish language – Azerbaijani – rather than Persian. 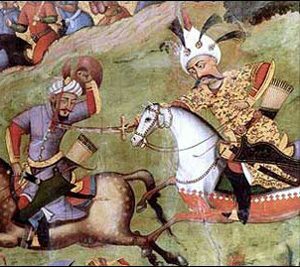 Like the other Altaic empires on either side of them – the Ottomans and the Mughals – the Safavids made good use of cavalry and of the new Chinese invention, gunpowder, in warfare. This is why some people call them the “Gunpowder Empires”. The new Safavid empire faced many challenges. They were an isolated group of Shiites defending a new empire against Sunni enemies. Sunni Uzbeks hemmed them in to the north, Sunni Ottomans to the west, and Sunni Mughals to the east. There was also a problem with the Silk Road. In the Persian Gulf, Portuguese traders were beginning to shift Silk Road trade to their own ships. Iran was losing control of the Silk Road. Everyone loved Ismail, but he turned out not to be the guy to solve these problems. He died of alcoholism in 1524, when he was only 36 years old. His Vizier had already been ruling in his name for some time. Ismail’s son Tahmasp succeeded him, but Tahmasp was only ten years old. So Azerbaijani viziers kept on ruling Iran as regents. But when Tahmasp grew up, he put men from Georgia and Armenia in power and pushed out the Azerbaijanis. In 1555, he made peace with the powerful Ottoman sultan Suleiman. The peace freed up Suleiman to attack Europe. And it freed Tahmasp to fight the Uzbeks. 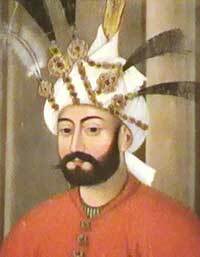 By protecting the Mughal Emperor Humayun, also, Tahmasp allied himself with the Mughals. He influenced the Mughals to speak Persian, paint Persian-style pictures, and read Persian literature. Tahmasp was poisoned and died in 1576, when he was 62 years old. His powerful daughter, Pari Khan Khanum, put her brother Ismail II on the throne, but he was a terrible and violent ruler who killed or poisoned their brothers, and after only about a year in power she poisoned him, too. She tried again with another brother, Mohammad Khodabande, who was almost blind. But Mohammed’s wife Khayr Al-Nisa Begum also wanted power, and killed Pari Khan Khanum in 1578, before being killed herself by Azerbaijani men who wanted power a year later (just as the Russian Elena Glinskaya was a generation earlier). So the rule of women failed in Iran, even though it succeeded in India, in the Ottoman Empire, and in Europe at this time. With all this fighting, the Ottoman ruler Nurbanu Sultan was able to seize a bunch of Iraq back again. But these civil wars ended in 1587, when the Azerbaijanis replaced Mohammed with his teenaged son Abbas Mirza – Tahmasp’s grandson and Khayr al-Nisa Begum’s son – who they thought would be easier to push around. Abbas turned out to be a strong character like his mother. He promoted his grandfather’s former slave-generals (like the Mamluks) and used their support to shove the Azerbaijanis who had killed his mom out of power completely. Now he controlled the tax money, and not the Azerbaijanis. Abbas used his new generals and his new tax money to fix up his army. He created a new, up to date, professional army armed with guns and cannons, and he trained his soldiers in battle order and prevented them from looting. 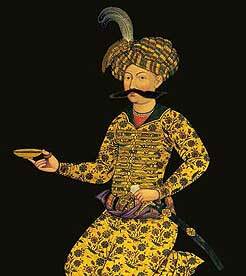 Once Abbas had a strong army, he used it to replace many local rulers with men more loyal to him, and then in 1598 he fought the Uzbeks and conquered Herat and what is now eastern Afghanistan. By this time, the British had beaten the Spanish navy, and the British were beginning to be stronger than the Spanish. Abbas sent an embassy to Spain, and negotiated with Queen Elizabeth over an alliance against Sofia Baffo and the Ottomans. At the same time, the Habsburgs in Austria were also attacking the Ottomans from the west. So it was a good time for Abbas to attack from the east. Sure enough, in 1603-4, Abbas reconquered Azerbaijan and the other land between the Black Sea and the Caspian Sea from the Ottomans, and then in 1618, Abbas easily defeated the Ottoman counterattack (planned by Kosem Sultan). By 1623, he had conquered Baghdad and most of what is now Iraq. Kosem Sultan gave up and turned her attention to conquering Europe and left the Safavids alone. Did you find out what you wanted to know about the Safavid Empire? Let us know in the comments. Cite this page: Carr, K.E. What was the Safavid Empire? History of Iran. Quatr.us Study Guides, September 11, 2017. Web. April 25, 2019.